The cartoon above, from the June 5 Haaretz editorial page, is Israel-style black humor. 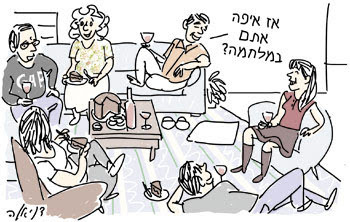 It is a parody of the standard question that Israelis ask one another before Passover and before the New Year: "Where will you spend the holidays?" In this cartoon, three couples are enjoying drinks and food in someone's home, and one of them asks, "So, where will you spend the war?" Israelis in many walks of life are talking about the possibilities that we will have a war with Syria this summer. A day after this cartoon appeared, the main front-page headline of Yedioth Ahronoth, the country's largest-circulation newspaper, was citing the Prime Minister's admonition to cabinet ministers and defense officials: "Olmert: Stop talking about war." Military and political analyses are available elsewhere. The purpose of this post is to note that the same Israelis who are talking about war are also engrossed in ordinary life---exams, vacation plans, the weather, day-to-day problems of making a living, how to get tickets for Jackson Browne's sunrise performance at Masada with David Broza, who will win the Labor Party runoff, and who will do what to whom in the telenovella Alufa when it returns to the air next week. A friend who excels at military-political analysis says this concern about small stuff as we stroll through the valley of the shadow of death is a good thing. The possibility of a terrible missile war will not go away, he says, and it is essential that we not let the threat divert us from leading our daily lives. Copyright - Original materials copyright (c) by the authors. Originally posted at http://israel-like-this-as-if.blogspot.com/2007/06/talking-about-war-with-syria.html. Please do link to these articles, quote from them and forward them by email to friends with this notice. Other uses require written permission of the author.